Weekends in the Napa Valley, as we all know, are busy. And weekends in Napa during harvest season are really busy. (It was impossible to get a dinner reservation last Saturday at a decent restaurant!) But when you take a weekend near the end of harvest and throw a little rain into the weather forecast for Monday, well, all hell breaks loose up here. Such was the case this past weekend in the middle and upper sections of the Napa Valley. 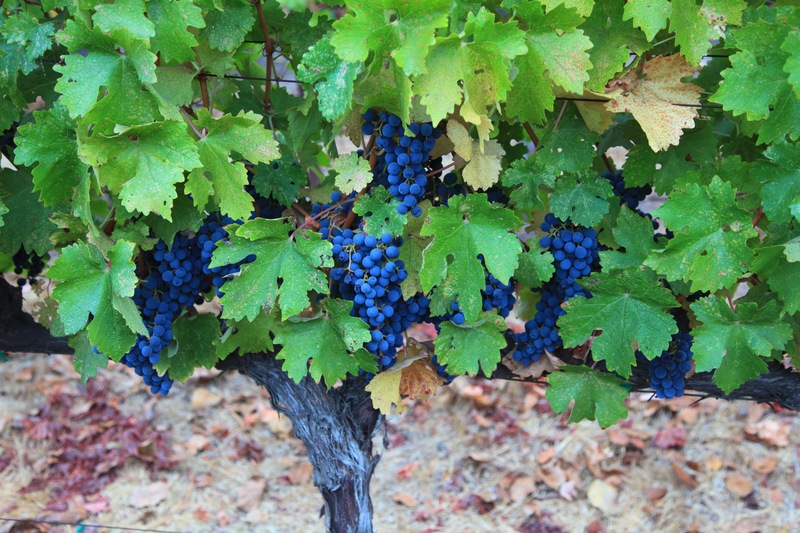 As I have mentioned before, the Cabernet grapes are typically the last to be harvested, so they can maximize the hangtime on the vine and develop to their ultimate potential. This growing season by all accounts has been among the very best on record, so fruit yields are way up from last year. Vintners wanted to give as much time as possible for all this abundant fruit to mature. And of course, it’s always a chess match with the weather gods, because most people would prefer to get their grapes off the vine before the rains come. (Rain can create mold, or rot, which is not the desired goal in wine.) Early last week things were going along swimmingly, and we could see and hear evidence that Cabernet harvest was going into high gear. But then the weather forecast started calling for rain on Monday, with the threat of it lasting for several days. All of a sudden, it seemed like everyone started harvesting at once, or tried to. 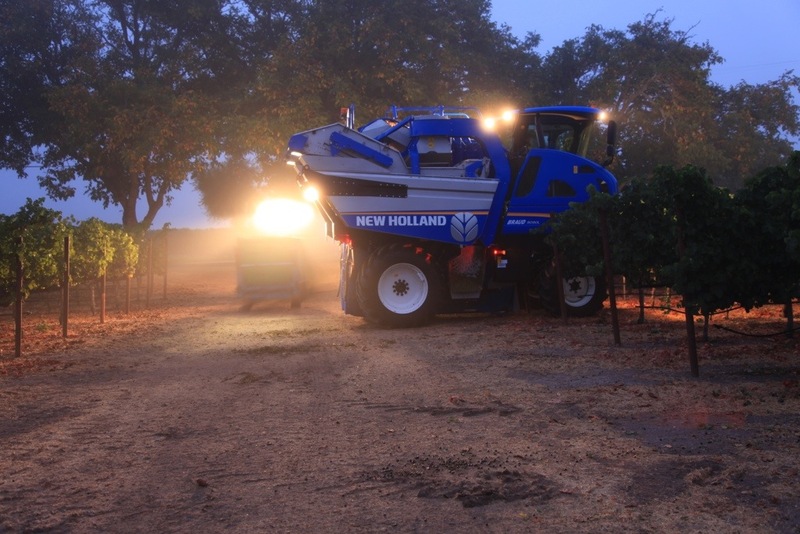 The number of trucks hauling bins (including in the wee hours) increased exponentially, and it was common to see lights illuminating vineyard rows in the evenings and mornings. A number of folks had planned to harvest this week or around Halloween, and then tried to quickly accelerate things to miss the rain, only to find that there were not enough picking crews to go around. I talked to one vintner who recruited family and friends to help pick a well-known vineyard on Sunday in order to beat the rain. I heard tales of a big vineyard, Stagecoach, where they were planning to harvest over 200 tons of fruit on Sunday, which is a tremendous amount of fruit for one day. But while some vintners rushed into overdrive, others stayed calm and let the rains fall where they may. While Monday brought over an inch of rain to Napa between midnight and 8am, the overall total was not so bad to cause damage to the grapes, and picking resumed unabated on Monday and Tuesday as planned. It remains to be seen what happens over the next few days, but I imagine we will see harvest wrap up by the end of this week (there are always exceptions! ), about 11 weeks after it started. It has been estimated by one vineyard manager–my friend Ron Wicker–that about 80% of the grapes in the valley are picked by hand. The crews who do this manual picking work in established teams, and they are paid as a team based on their yield. The more they pick in a given amount of time, the more money they all share. It therefore did not surprise me to learn that these crews are very particular about who is on the team. They won’t just take random additions, because they want to make sure that everyone pulls their weight, works within their well-oiled processes, etc. (Apparently there are certain protocols about passing the small picking bins back and forth under the vines to be dumped into the hauling bins, and passed back, and it takes a fair amount of teamwork. The established crews do this very well.) The amount of work that these crews can do in a couple of hours is staggering; and it needs to be, given the thousands of acres of grapes that must be picked in a very short amount of time. So what about the other 20% of the grapes that are not picked by hand? Those are harvested by machine, and I was given the opportunity a couple of weeks ago to witness this process first-hand. I was invited out by the folks at Clos Du Val to watch as they machine-harvested Merlot grapes from their leased acreage at Regusci Vineyards, on the Silverado Trail. 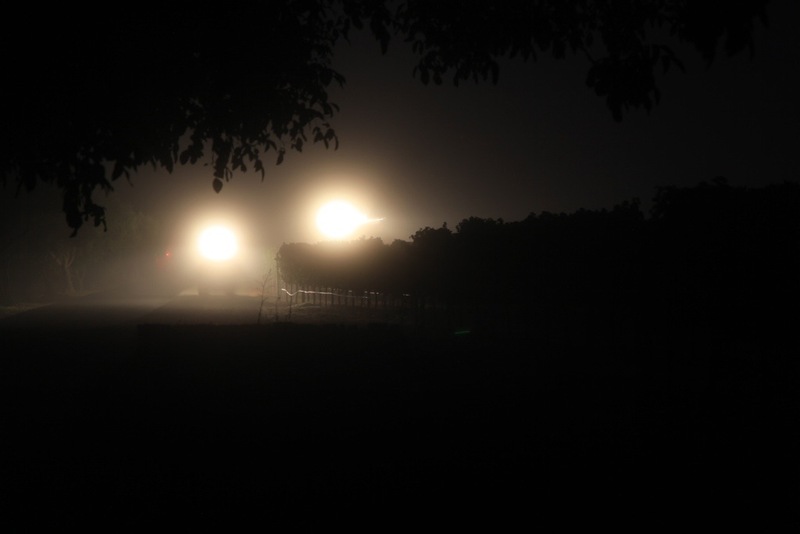 Although it was completely dark as I drove into the winery at 6 am, there was a stationary light where the harvested grapes were being stored for trucking, and out in the vineyards I could see a bright light where the harvester was at work. I checked in with the supervisor and headed down to the block being harvested. The scene when I arrived was like that out of a scary movie. 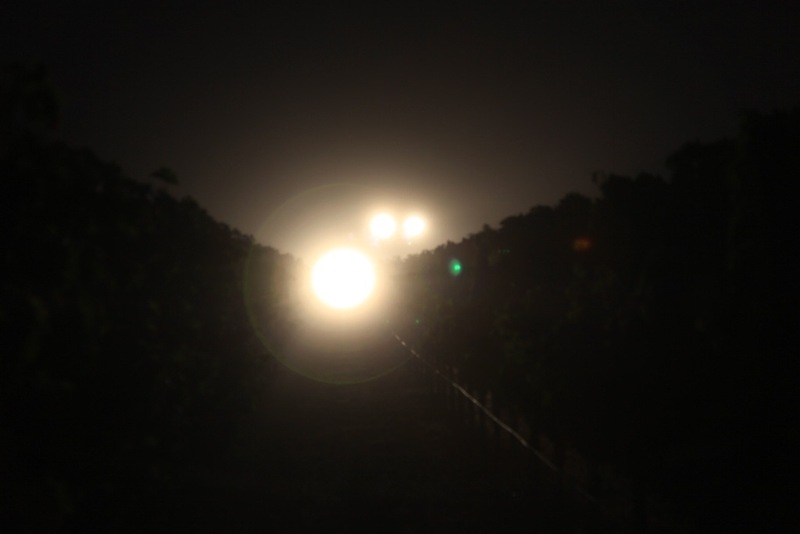 As I stood (safely, I hoped) at the end of an aisle, in the “avenue” that separates blocks of vineyards, all I could see were intensely bright white lights coming toward me, illuminating the vines. The sound of machinery approaching, as the lights became brighter, was a bit intimidating. I made sure I was safely tucked back into the next rows of vines so I would not be trampled when the harvester hit the end of the row. It soon made the turn into the wide avenue and I was finally able to see the beast that had just harvested an entire row of grapes in about two minutes. Even in the darkness, it was impressive, and resembled some sort of giant Tonka truck. It spun around and lined up to gobble the next row, but before it did, a tractor pulling a valley bin pulled behind the harvester. 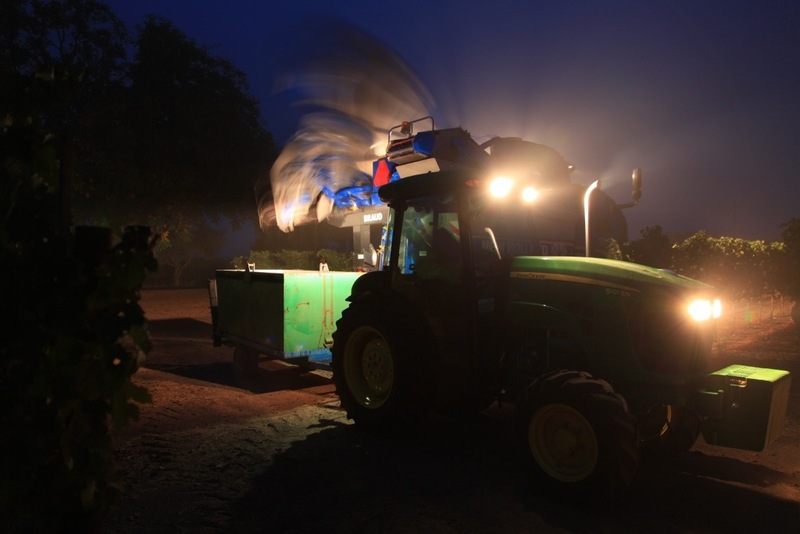 The harvester then lowered down a couple of feet, and one of the “wings” on the back lifted high in the air, and hundreds of pounds of grapes rushed out into the bin below. When they were all out, the arm returned to its position on the back of the rig, and the other wing on the left side raised up and it, too, deposited hundreds of pounds of grapes into the bin, before returning to place. The tractor quickly moved away, and then the harvester expelled a bunch of leaves and other green material out the back, raised back up a few feet, and proceeded to gobble up the next row of grapes. It was, in a word, amazing. At this point, the Tonka truck analogy was inadequate. What this thing was, clearly, was a Transformer! And that’s when I named it “Optimus Wine.” (You may have to Google “Optimus Prime” if you don’t already understand where this name came from.) As it moved down the row into the darkness, it did not make any thrashing or grinding noises as I expected it to. Instead, it just sort of “hummed” as it denuded the vines of their fruit. I watched all this for about half an hour and snapped off photos in the dark, and finally retreated to the staging area. It was explained to me that the harvester uses “harmonic vibrations” to remove the berries from the clusters. It is so tunable that it can be set to only remove the ripest fruit now, and leave unripened berries on the vines for a possible later harvest. 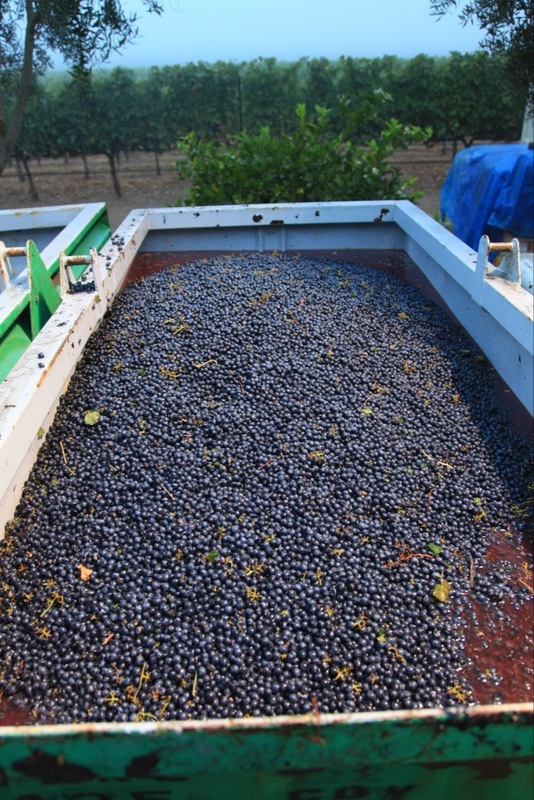 Over ripened fruit may even stay on the vines due to how the machine is calibrated. Very few leaves fall off, and those that do somehow manage to make their way into the harvester are separated out on an internal automated sorting table. It’s really quite remarkable. Later, the vineyard manager suggested I go back in the light of day and examine the rows that had been harvested by the machine. 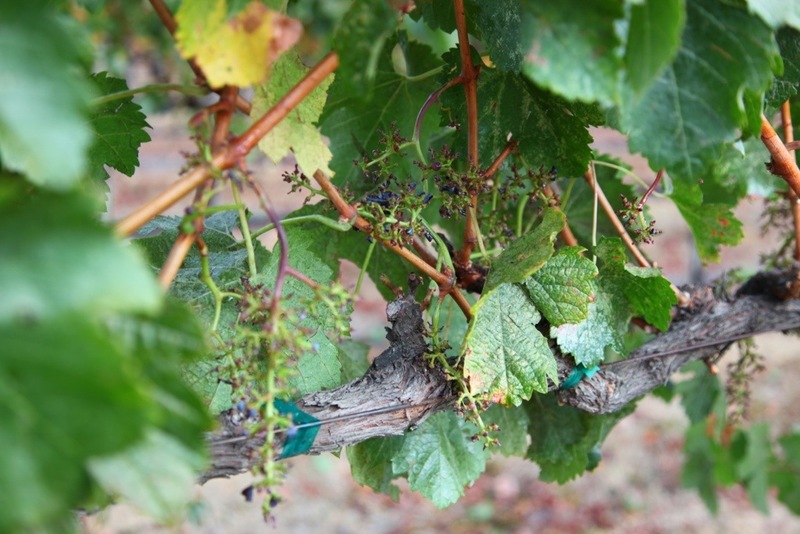 The photo is proof that the cluster stems remain on the vine, and only the berries have been removed. The ground below was pristine; much cleaner than a row that has been picked by hand, which is usually full of dropped berries and leaves. Another machine harvester (an older model) stood idle nearby, and I was able to get a good look inside. 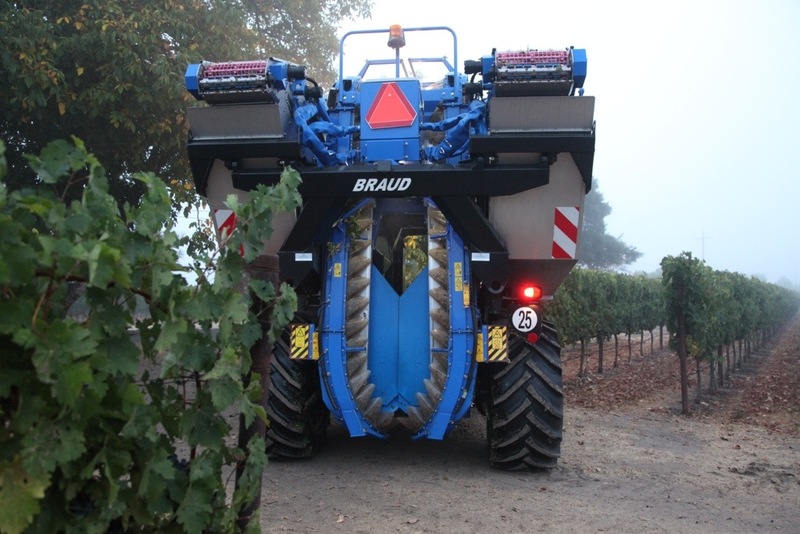 The machine is designed so that it straddles one row of vines at a time, and the trunks of the vines pass through narrow openings that run the length of the harvester. 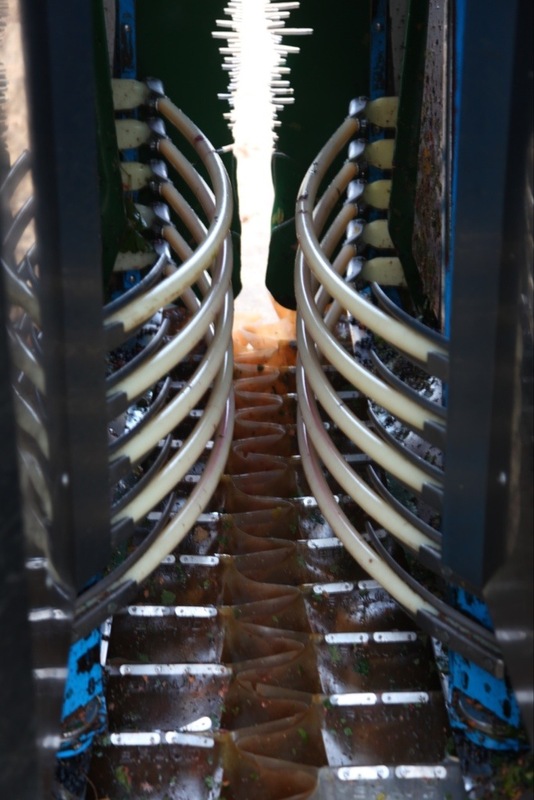 Two sets of conveyorized rubber “trays” are interleaved with each other (one on the right side of the machine, and one on the left) and they catch all the grapes that are shaken off from the vibrations, and then carry them up to one of the two vestibules on the two sides of the rig. Because the rubber trays are flexible, they move out of the way of the trunks, but otherwise form a complete seal and catch everything that falls. This is why you don’t see any fruit on the ground after the harvester has passed. So if this machine is so cost-efficient and fast and neat, why don’t more vintners use them? Well, certainly the price tag is one reason, not to mention the fact that the vines must be maintained and trellised in a certain way to allow for machine harvesting. Some terrain will not accommodate a harvester no matter what. And finally, many winemakers have egos that insist that their wines are picked by hand so that they can justify a lofty per-bottle pricetag. All I know is, a whole lot of people this past weekend wished they could have turned one of these beasts loose on their vineyards so they could have harvested their remaining fruit before the rains came! This entry was posted in Napa, Wine. Bookmark the permalink.